For those who remember the Sugerhill Gang's "Rapper's Delight" lyrics recorded in 1979, it's a perfect theme song for a very unique kangaroo that just hopped off a German assembly line this past month. 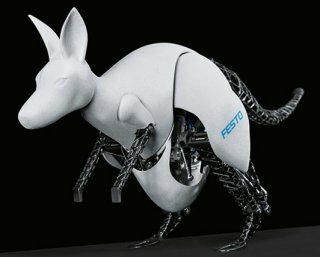 After two years of research, the tech company Festo and their engineers have unveiled the first "bionic kangaroo" whose movements are closely patterned after the actual marsupial's unique hop. Powered by electric drives and pneumatic pumps, this "Robo-Roo" can recycle kinetic energy from one jump to the next via an elastic "Achilles tendon." In nature, the kangaroo 's ability to reuse energy allows it to cover vast distances at high speed. Without it, they would tire quickly. So like its natural model, this robot can also recover that energy when jumping, store it and efficiently use it for the next jump. 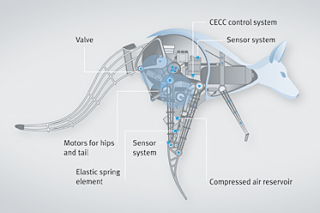 According to a recent Discovery.com review, every year, Festo creates innovative robot designs as part of its "Bionic Learning Network," which seeks to use "principles from nature to provide inspiration for technical applications." Robot penguins, seagulls and jellyfish are among its previous projects. Surprisingly enough this scientific approach of mimicking nature is not new. In fact, it dates back over 500 years to the many inventions of Leonardo Da Vinci. In this YouTube video, the Renaissance man patterned his flying apparatus after he studied and diagrammed the lift and thrust of a bird's wings in flight. As far as other types of "bionic pets" -- separate from a full-blown robot -- many pet owners and zoologists have been advancing make-shift prosthetic technology designed specifically for live animals who have experienced disabilities or abuse. From lame horses, to dog and pig amputees, the new PBS documentary "My Bionic Pet" follows several of these remarkable true-life stories about animals, their rescuers and the prosthetic inventors who have helped these animals continue to live their lives to the fullest, even though they're handicapped. And for those who've have forgotten or would just like to refresh their memories with a blast from the past, here's that rap tune those German scientists at Festo might want to consider obtaining the rights to when they market their "Bionic Kangaroo" to the public. After all, what other purpose will "Robo-Roo" serve, beyond it's ability to perform and bring a smile to people's faces? The "Happy Pig Day!" Animal Video Of The Day!! !